Using small apple corer or sharp paring knife, carefully remove hulls from strawberries. Cut small portion off bottom of each strawberry so it will stand. Invert strawberries onto paper towel to drain. Into small bowl, beat cream cheese, powdered sugar and vanilla with electric mixer or whisk until well combined. Transfer cheese mixture to decorating bag. Or spoon mixture into small resealable food-storage plastic bag; seal bag and cut small hole in one bottom corner. 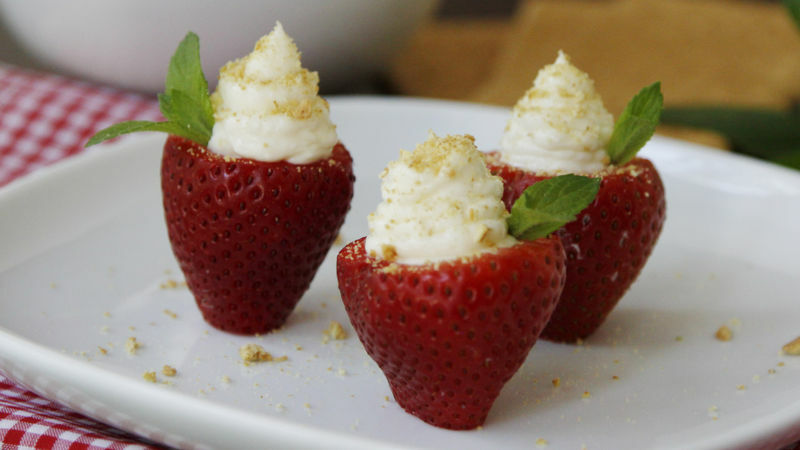 Sprinkle tops of filled strawberries with graham cracker crumbs. If cream cheese mixture isn’t sweet enough for your taste, add more powdered sugar. Garnish with small fresh mint leaves, if desired.